There’s a meaty war brewin: just two days after Pilgrim’s Pride made a bid to take over Hillshire Brands, Tyson Foods crashed the party and upped the stakes with a bid of its own. Arkansas-based Tyson Foods, one of the largest producers of chicken, pork and beef products, offered $6.8 billion for Hillshire, the company known for its Jimmy Dean breakfast sausages and sandwiches and a plethora of flavored hot-dogs, The New York Times reports. 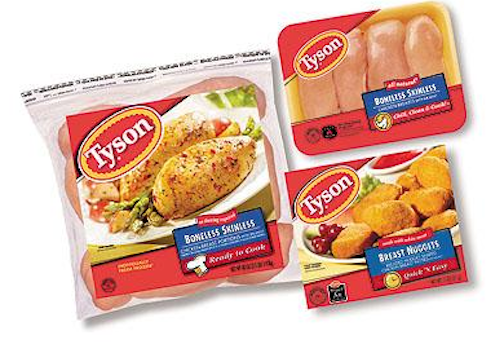 “We believe that there is a strong strategic, financial and operational rationale for the combination of Tyson and Hillshire,” Donnie Smith, Tyson Foods President and CEO, says in a news release. The new bid tops the Colorado-based Pilgrim’s Pride bid of $6.4 billion, but comes with many of the same caveats; namely the end of Hillshire’s purchase of Pinnacle Foods. Less than two weeks ago, Hillshire announced it would acquire Pinnacle Foods, the company behind brands like Vlasic and Duncan Hines, for $4.2 billion. But that’s a move neither Tyson Foods or Pilgrim’s Pride wants anything to do with. “Our interest is in the Company on its own, and not as combined with Pinnacle,” Smith says in a news release about the offer terms. According to the Times, Hillshire has long been a target for an acquisition. Pilgrim’s Pride privately approached the company about a merger several months ago but was rebuffed. Smith, Tyson Foods CEO, wrote in a letter to Hillshire Brands CEO Sean Connolly that the company would have preferred to keep its dealings out of the spotlight but recent events prohibited that.